The Democratic Republic of Congo (DRC), known as the Congo Free State (1885-1908), Belgian Congo (1908-1960), the Democratic Republic of the Congo (1960-1971), and as the Republic of Zaire (1971-1997), is located in Central Africa, with a short Atlantic coastline (37 km). It is the third largest country in Africa by area (2,345,409 km2) and the 12th largest in the world. With an estimated population in 2010 of 70,916,439, the Democratic Republic of the Congo is the nineteenth most populous nation in the world. Congo borders the Central African Republic and Sudan to the north; Uganda, Rwanda, and Burundi in the east; Zambia and Angola to the south; the Atlantic Ocean to the west; and is separated from Tanzania by Lake Tanganyika in the east. The Congo Free State was formed in 1885 as the personal private property of King Leopold II of Belgium. Belgium took over the free state as a Belgian colony in 1908, and Congo became independent from Belgium on 30 June 1960. Congo's history since independence has been one of violence and corruption. The Second Congo War, beginning in 1998, devastated the country and is sometimes referred to as the "African World War". The war is the world's deadliest conflict since World War II, killing 5.4 million people. Christianity is the majority religion in the Democratic Republic of the Congo, followed by about 90% of the population. Recent figures show that 55% are Roman Catholic and 35% are Protestant, with Animism accounting for 2.4%. The Democratic Republic of the Congo has been an area of major Mennonite interest and ministry in the 20th century. The Congo Inland Mission (CIM), known since 1971 as the Africa Inter-Mennonite Mission (AIMM), placed its first missionaries in the West Kasai region of south central Congo in 1912. Already in 1913, Aaron A. and Ernestina Janzen, a Mennonite Brethren couple from Mountain Lake, Minnesota applied for service with the CIM and served until 1920. Upon returning to the Congo, they opened an independent work at Kafumba, a location south of Kikwit along the Kwilu River in an unevangelized area later known as Bandundu Province. Following World War II, some small faith missions of that region were no longer able to keep pace with the changes and demands of work of the post-war era and appealed to other missions to assume responsibility for the ministries they had launched. It was at this juncture that the Mennonite Brethren Board of Missions and Services (BOMAS) decided to assume responsibility for the Kafumba work pioneered by the Janzens, and at the same time, to broaden their ministry to cover some of the areas which were being relinquished by other missions. From its administrative base at Kikwit, the BOMAS ministry was eventually extended to incorporate mission posts at Matende, Kipungu, Lusemvu, Kajiji, and Panzi, all of which were located in the southern part of Kwilu Province. CIM ministry began at a place called Djoko Punda (known during the Belgian era as Charlesville). Located at the farthest navigable point inland on the Kasai River, among a mix of Lulua and Baluba people, it quickly became the post of supply for the new CIM work as well as its first point of evangelism. A primary school was early established; it was quickly followed by the mission's first Bible school. A second CIM mission post was also immediately established several days trek south of Djoko near a village called Kalamba. This location was deliberately selected since it was adjacent to the home village of the king of the Lulua people. In 1946 the decision was made to move the station some 11 miles (18 km) to the northwest where it was renamed Mutena. This post remains an important center of the Communauté Mennonite au Congo (Congo Mennonite Church). With the end of World War I and the arrival of new missionaries, high priority was given to a ministry among the Baphende people to the south and west of Djoko. A hardy, industrious, and agrarian people, they had no resident witness to the gospel among them. After some exploratory evangelistic trips made by missionaries and national Christians, a site was chosen near Nyanga village some 100 miles (160 km) southwest of Djoko. By 1920 the first new missionaries took up residence at this third post. Following the pattern established at the previous two stations, primary education and the dispensing of basic medications soon became part of the ministry along with Bible instruction and apprenticeship in evangelism for new converts. Since the majority of the Baphende people lived to the west of the Loange River in neighboring Kwilu Province (later known as Bandundu Province), plans were early laid to situate a fourth post somewhere in the tribal area west of the river. By 1923 further missionary personnel arrived and the first team was placed adjacent to a large village called Mukedi, the location of an influential paramount chief of the area. Thus by the late 1920s the CIM work was based at four stations in two provinces. A notable feature of the broader Congo mission scene by this time was the emergence of a strong and influential inter-mission organization known as the Congo Protestant Council (CPC). A large country with a great variety of ethnic groups, Congo early attracted a growing number of Protestant missions. This mission community eventually reached a total of some 55 different organizations sponsored by a mix of European and North American Protestant church groups. Of whatever origin or theological stance, all quickly encountered the aggressive and combative personnel of the Roman Catholic missions. The Protestant missions, of whatever origin or persuasion, early discovered that there was much to he gained by closing ranks and in dealing with the government and the favored Roman Catholic Church from a stance of solidarity. A CPC office was soon established in the capital of the Belgian Congo, Leopoldville (known as Kinshasa after political independence), as annual consultative assemblies became traditional. CIM and the Mennonite Brethren Mission early joined this council and participated actively in meetings and special commissions. World War II brought with it several far-reaching changes for mission work in Congo. The colonial administrators had recruited Congolese troops who were sent to fight in North Africa. As these troops were eventually brought back home and discharged, they returned to their home villages with greatly broadened understandings and aspirations. Some even dared to express the opinion that the Belgian colonial rule under which they lived was not something to be simply accepted forever. 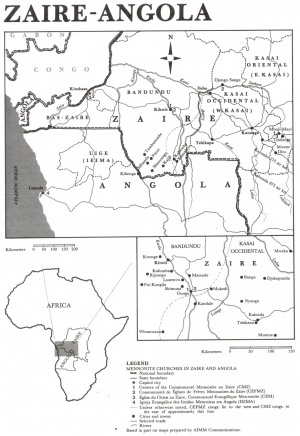 Mennonite Churches in Congo and Angola, 1980s. Mennonite Encyclopedia, v. 5, p. 955. In Belgium also there was dramatic post-war change. Angered by what they considered to have been collaboration on the part of King Leopold III with the German occupation forces during the war, the Belgians not only insisted that he yield his throne to his son but on the occasion of the first elections they repudiated the Catholic party which had long dominated the Belgian political scene replacing it with a new coalition government made up of Socialists and Liberals. Among the changes which the new administration introduced was the offer to Protestant missions in the Congo of government subsidies for medical and educational work which met government standards. After some debate, the great majority of the Protestant missions in Congo opted to apply for these funds. There promptly followed a major expansion of Protestant educational and medical work across the land, an expansion in which the CIM and BOMAS fully shared. Not only was this a time of new financial resources from a new and sympathetic colonial regime, but it was also the time of a surge of new missionary recruits. In the West Kasai, CIM had already pinpointed areas where its ministry was still inadequate. Some 75 miles (120 km) northwest of Djoko was a large ethnic group known as the Bashilele. Until the late 1940s, CIM's ministry among them had been largely limited to regional school centers and periodic evangelistic trips. With much encouragement from the Congolese believers of the area, the decision was made in 1950 to establish a fifth station at a place called Banga. At the same time, there was growing concern for a rapidly expanding diamond mining center called Tshikapa that was located along the Kasai River between Djoko and Mutena. Already the site of a large Catholic mission, CIM efforts to minister to the steadily growing number of Mennonite Christians living in work camps at Tshikapa consistently encountered frustrating limitations. Parallel requests to secure a plot of ground in the vicinity were also denied. Finally, in 1950, through the intervention of the CPC secretary in Kinshasa, government permission to occupy a hillside five miles across the river from the diamond center was granted. Taking its name from an adjacent village, the sixth CIM station was called Kalonda. To the west in Bandundu Province, where a cluster of small faith missions were having difficulty coping with the new postwar era, opportunity also came to the CIM to acquire two new mission posts. Near the Angolan border in Kahemba territory was Kamayala, a mission post established under the auspices of the Unevangelized Tribes Mission in 1930 by two extraordinary sisters, Bertha and Mary Miller. This mission, like others, also made an appeal to other organizations to assume responsibility for ongoing ministry. The CIM responded in 1952, thus beginning its first ministry among Chokwe and Lunda people. Between Kamayala and Mukedi was Kandala, a station which had been started in 1926 by a pioneering Canadian Baptist couple, Percy and Rosalie Near, and was also situated among the Baphende people. The Nears approached CIM about assuming leadership for the work. Terms were agreed upon and the first CIM personnel arrived on the station in 1954. CIM and Mennonite Brethren (MB) areas lay side-by-side in Congo and eventually gave rise to three autonomous Mennonite churches. All are part of the national Congolese church, the Eglise du Christ au Congo. Stemming from the work of the CIM were the: Communauté Mennonite au Congo and ECZ: Communauté Evangélique Mennonite (Democratic Republic of Congo). The church which grew out of the work of the Mennonite Brethren came to be known as Communauté des Églises de Frères Mennonites au Congo. CIM and MB missionaries were partners in several cooperative ventures across the years, notably in a four-year teacher training school at Nyanga in the early 1950s; a missionary children's school at Kajiji, 1954-60; and a pastoral training school, also at Kajiji, 1963-68. Both Mennonite missions were founding partners of the Theological Institute of Kinshasa (Institut Supérieur Théologique de Kinshasa; ISTK), a venture in which 10 other mission groups originally shared. Both CIM and BOMAS provided teaching staff for this school after it opened. All three Mennonite churches sent pastoral candidates there for training. Mennonite Central Committee (MCC) first became involved in Congo in the 1950s, when a few North American conscientious objectors were sent as alternative service volunteers. In the aftermath of political independence (1960), MCC teamed with the Congo Protestant Council to form the Congo Protestant Relief Association (CPRA), which became a channel for relief supplies for various areas where local populations were displaced by political unrest. Known as ZPRA, this cooperative project with Zaire (Congo) mission and church communities continues. It was also in the 1960s that Congo became one of the areas selected by MCC administrators for service for Pax and Teachers Abroad Program (TAP) personnel. During that decade a steady stream of young people came to Congo, where they served in a wide variety of roles with Mennonite and other missions. MCC eventually moved beyond construction sites and schoolrooms to cooperative efforts with Congo Mennonite churches in various rural development projects. By the 1980s , MCC collaborated with the three Zaire (Congo) churches in helping to sponsor seminars for pastors on a variety of topics including issues of peace, justice, and development. French-speaking Mennonites from Europe and North America were resource people for these much appreciated sessions. The three Mennonite churches in Congo are situated in a land of great potential, and they are confronted by formidable problems. Economic inflation and devaluation of national currency have been steady since the 1970s; dishonesty and graft have surfaced at many levels of public life. All of this exerted tremendous pressure upon the Christian community of the country. In the midst of grievous social and economic problems, however, it is heartening to note that wherever pockets of stability and integrity are found, invariably they are church-related. Both in terms of political development and church growth on the continent of Africa, more will be heard from Congo and its Mennonite churches in coming years. Juhnke, James C. A People of Mission: A History of General Conference Mennonite Overseas Missions. Newton, KS: Faith and Life, 1979. Kraybill, Paul N., ed. Mennonite World Handbook. Lombard, IL: Mennonite World Conference, 1978: 104-116. Mennonite World Conference. "2000 Africa Mennonite & Brethren in Christ Churches." Web. 2 March 2011. http://www.mwc-cmm.org/Directory/2000africa.html. [Broken Link]. Mennonite World Conference. "Mennonite and Brethren in Christ Churches Worldwide, 2006: Africa." Web. 2 March 2011. http://www.mwc-cmm.org/Directory/2006africa.pdf. [Broken Link]. Mennonite World Conference. "World Directory 2012: Mennonite, Brethren in Christ and Related Churches." Web. http://www.mwc- cmm.org/sites/default/files/website_files/mwc_world_directory_w_links.pdf. Mennonite World Handbook Supplement. Strasbourg, France, and Lombard, IL: Mennonite World Conference, 1984: 19-21. Toews, John B. The Mennonite Brethren Church in Zaire. Fresno: Board of Christian Literature, 1978. Wikipedia. "Democratic Republic of the Congo." Web. 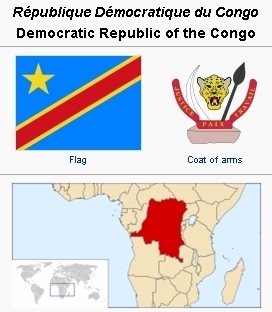 7 March 2011. http://en.wikipedia.org/wiki/Democratic_Republic_of_the_Congo. Bertsche, James E. and Richard D. Thiessen. "Congo, Democratic Republic of." Global Anabaptist Mennonite Encyclopedia Online. March 2011. Web. 18 Apr 2019. http://gameo.org/index.php?title=Congo,_Democratic_Republic_of&oldid=131270. Bertsche, James E. and Richard D. Thiessen. (March 2011). Congo, Democratic Republic of. Global Anabaptist Mennonite Encyclopedia Online. Retrieved 18 April 2019, from http://gameo.org/index.php?title=Congo,_Democratic_Republic_of&oldid=131270. Adapted by permission of Herald Press, Harrisonburg, Virginia, from Mennonite Encyclopedia, Vol. 5, pp. 953-956. All rights reserved. This page was last modified on 23 March 2015, at 19:09.